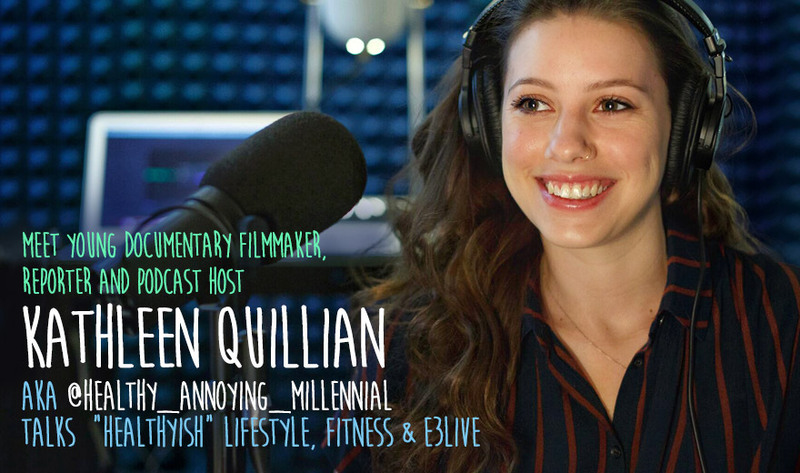 Young documentary filmmaker, reporter and podcast host Kathleen Quillian aka “Healthy Annoying Millennial” jumped into a healthy lifestyle after an illness. She started following an anti-inflammatory diet and added superfoods to her life. Through her Instagram account @healthy_annoying_millennial she shares her passion for “healthyish” living. 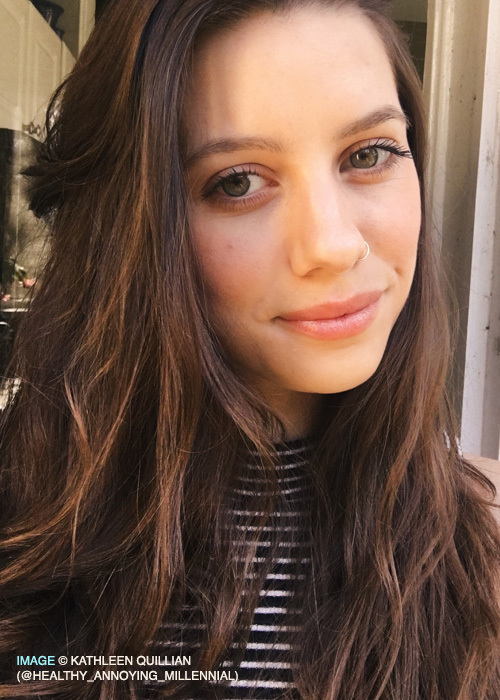 We check in with her about health, fitness, happiness and E3Live superfoods. 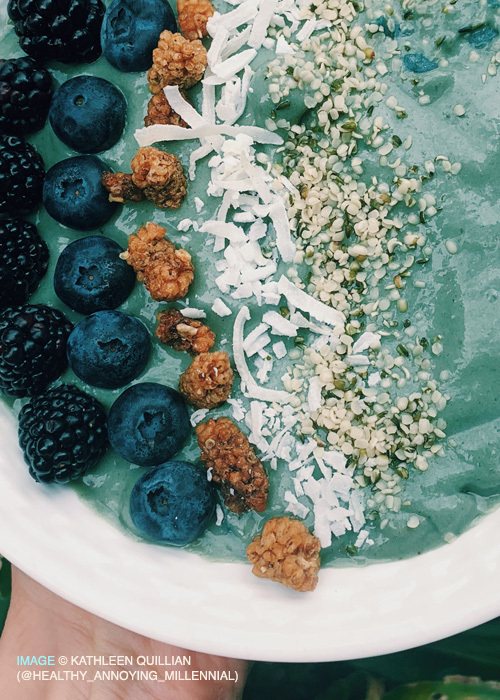 Tell us about yourself, and your life as a "healthyish" millennial. Hey! My name is Kathleen Quillian, I am 25 years old and I am an Atlanta native. I am a freelance documentary filmmaker, reporter, and podcast host. I have a passion for storytelling and interviewing. I grew up in the historic neighborhood of Inman Park, I was very lucky to be surrounded by incredible food at a very young age. I also grew up in a family of very talented cooks! My brother is a trained chef and my mother is one of the best cooks in the world (I know everyone says that about their mom). I love the history and stories that can be told through food. Some of my favorite chefs are Ina Garten, Anthony Bourdain, Samin Nosrat, and Hemsley + Hemsley. When and why did you become interested in a healthy lifestyle? Last March I became incredibly ill. I was given so many different pills and misdiagnosed with so many things it made my body completely out of whack. I was so frustrated going to doctor after doctor claiming they did not know what was wrong. As a young woman in your 20s, it's really hard to get doctors to really listen to you and hear your symptoms. Doctors think you are young - you should be fine! Or you are a young woman you are just being hysterical. I finally had a doctor suggest I get off all medication and start an anti-inflammatory diet. For the diet, I focused on foods in high antioxidants, berries, avocados, dark leafy greens, sweet potatoes, broccoli, walnuts, almonds, flax seeds, chia seeds, turmeric, ginger, chicken, fish, and eggs. I cut out dairy, soy, and red meat. Two weeks after I started the diet I could see significant improvements. I started to really learn about my body and what I was putting into it! I think this was the first time I really focused on eating whole foods. I finally started to read the ingredients of what I was buying, this is so important. I learned to keep things simple when it comes to the ingredient list, do not buy something with an ingredient you cannot pronounce. I decided to start the healthy_annoying_millennial on Instagram to keep myself accountable for healthy eating and to follow other accounts for inspiration (like E3Live). I decided to call myself out for what I really am, a healthy annoying millennial...why not have fun with it? But my account is also all about balance! I am a southern girl and I love all kinds of foods, yes I still eat cheese and fried chicken every now and then. I like to share the healthy food I create but love to show new restaurants and delicious baked goods. I love to bake! What are your favorite E3Live superfoods and why? I love Blue Majik and BrainON! I cannot get over the beautiful natural color of both. These super powders make me feel incredible. I love to incorporate them into my drinks or food every single day. I can tell the difference with my energy levels if I miss a day of using my E3Live superfoods. I add them to my homemade green juices, smoothies, yogurt, and chia pudding. What are your top 3 favorite hashtags (#) to use? What are your top health and fitness tips? I was a collegiate soccer player. I was also a very active child, I played every sport possible. Soccer, softball, basketball, swimming, diving, gymnastics, and water polo. But being so active and playing at a high level meant a lot of injuries. I just had my fourth knee surgery this past December. I have had to go from being incredibly active to really slowing things down. I am not a gym or high-intensity workout class kind of girl. I really have fallen in love with yoga. I am still heartbroken I cannot play soccer anymore but it is really about taking the time to experiment to find out what you like. I think a bit of movement every day is so important, honestly, my favorite post surgery fitness? Long walks around the neighborhood. 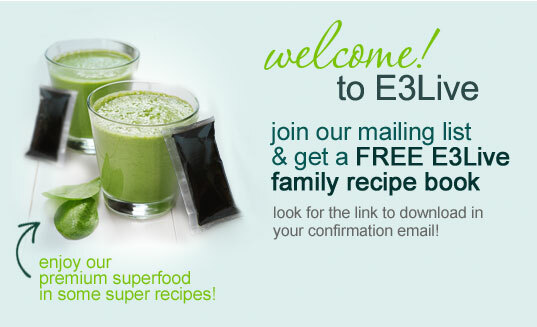 How do E3Live superfoods help with your everyday life? Blue Majik and BrainON make me feel the best in the mornings. I can really tell the difference in my energy and focus when I use them. I adore that they are completely natural and not filled with junk like other companies. Because you know how important ingredients are to me! 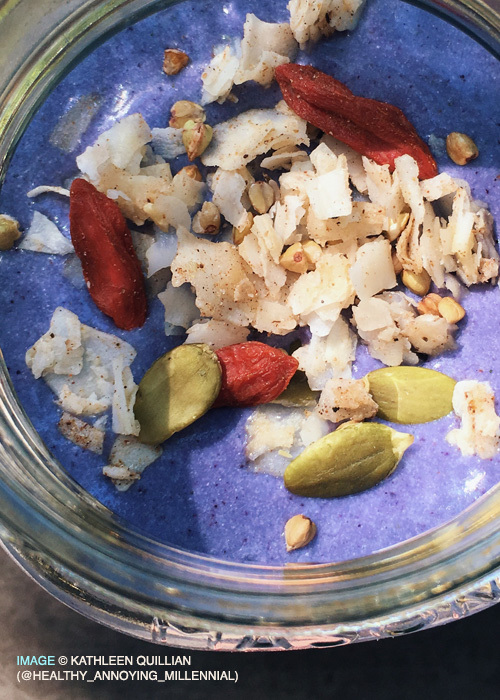 What would you say to other millennials to convince them to take E3Live superfoods? I adore E3Live superfoods because they are one of the only supplements I have used that I can actually see make a difference. Also if you do not want to use chemicals to color your food, why wouldn't you use beautiful natural products like Blue Majik? I love the community that E3Live has built on social media, they share so many recipes and important information that I love. I am getting married in April and moving out to Sausalito, California, right outside San Francisco. I am so excited about this new journey ahead with my soon-to-be husband. I have lived in San Francisco on and off for a couple of years and I am looking forward to it becoming my new home. California is the mecca of healthy foods and products, I am hoping this helps the @healthy_annoying_millennial page flourish. "Blue Majik and BrainON make me feel the best in the mornings. I can really tell the difference in my energy and focus when I use them. I adore that they are completely natural and not filled with junk like other companies. Because you know how important ingredients are to me!" 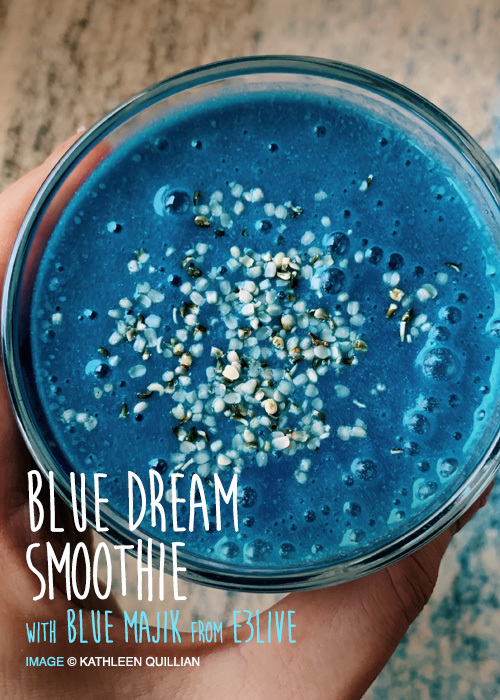 BLUE DREAM SMOOTHIE using E3Live's Blue Majik superfood spirulina extract and BrainON. 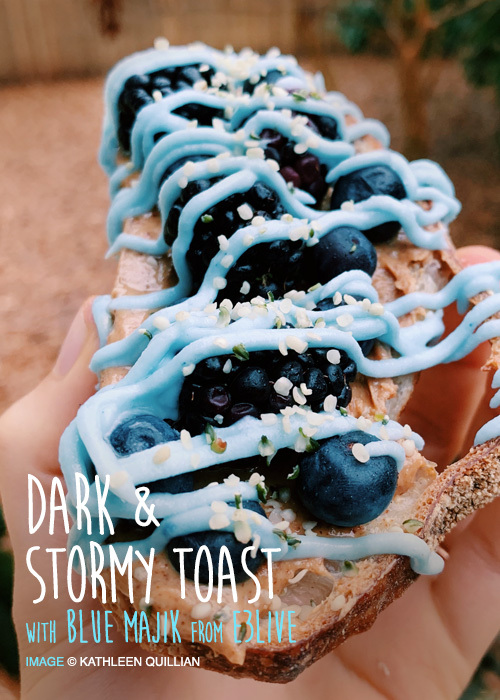 DARK AND STORMY TOAST using E3Live's Blue Majik superfood spirulina extract.